Upgraded turbos with stock downpipes/exhaust? Can any tuner do this? The country I'm in is quite strict about exhaust laws. How much power would it make? Yes you can upgrade turbos without changing exhaust parts, but you won’t get the maximum potiential out of the turbos while having the exhaust restriction of Oem cats. I'm fine with less power, any idea how much less? Catalytic converters usually rob about 30-50whp in forced induction cars depending on power levels and how much of a restriction they’re acutally causing. A car running 10psi of boost isn’t going to be as restricted by the cats as a car running 30psi. Even literature from Weistec says that their W'X' turbo upgrade kits are compatible with stock OEM downpipes. The Brabus B650 kit gets 650HP from a tuning box and bigger turbos, everything else stock. 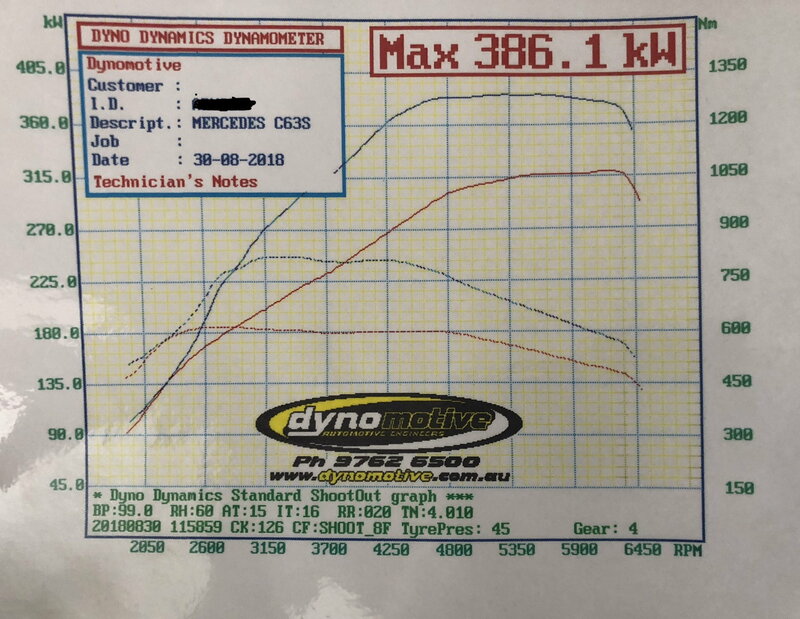 That stock power level of around 320kw at the wheels is accurate to what most people are getting here in Australia. Interesting re. the plug gap adjustment. If need be you can send info via PM. There's also a tuning outfit in Airport West and another in Boxhill? There's also Brabus (Sharps Performance) in Southbank for those who want major modding with OEM type warranty. interesting you own the practice next door to Chasers, it is a small World lol. Agree re Brabus very expensive for what you get and because of the warranty they offer I've noticed their tunes are more conservative compared to what others deliver with similar hardware obviously to stay on the safe side. There are also some tuners in the Dandenong and other Sth Eastern suburbs starting to do work with the M177. Give these guys a call. I have had many cars tuned over the years... this is probably the best tune I have had. Massive torque and power increases but drivability is stock standard. The owner has a C63s and has the developed the tune really well. Go see him and he will take you for a drive in his car. You will be impressed. My car only had 3,000 km when it was tuned and other than tune is totally stock. The owners car is getting just over 410wkw but his car has more km than mine. Stock turbos. He has also developed the willall tunes that most a45 AMG are running in Australia. Last edited by Zeek1; 11-06-2018 at 09:09 AM. So you close the gap for higher boost applications? What plugs do you guys typically use? Thanks Zeek, I've actually been following your posts with interest as the Unichip seems like a very good option, awaiting on the outcome of the new JB4 as it will have end user adjustability with obvious benefits compared to other piggy backs. I intend going this way first then if need be progressing to something like a PT stage 1 as IMHO that's the best or as far as I'd want to go on this platform for actual useable performance gains. All good and thanks again Mr747 - as mentioned a PT stage 1 is IMHO the way to go with this platform, beyond a remap or tuning box. In combination with JB4 should be interesting. Quick Reply: Upgraded turbos with stock downpipes/exhaust?